Per his military service record (regimental no. 4847), James Maher was born at Gilgandra, N.S.W. He gave his age as 18 years, his marital status as single, and his occupation as farm labourer. His description on his medical was height 5 feet 7 inches, weight 136 lbs., with a medium complexion, grey eyes, and dark brown hair. His religious denomination was Roman Catholic. He claimed to have 7 months previous experience with the Gilgandra Rifle Club. He completed his medical, and was attested, on the 14th October 1915 at Dubbo, which was the day the Co-ees left Dubbo on the Coo-ee March. His official date of joining the A.I.F. on his Attestation Paper in his service record is the 14th October 1915, the day the Coo-ees marched from Dubbo to Wongarbon. 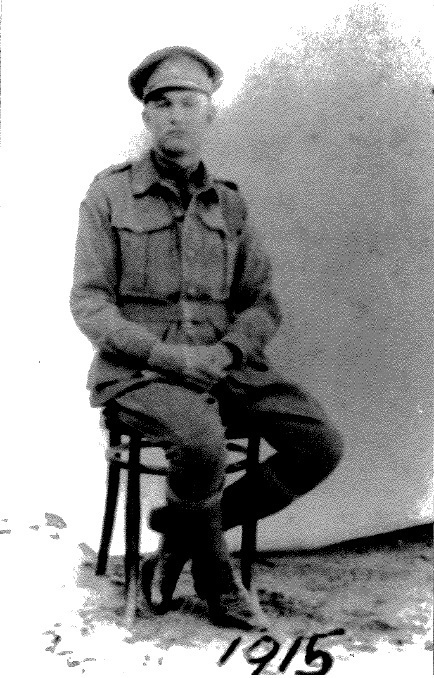 James “Jim” Maher is however known as one of the 35 recruits from Gilgandra – one of those who caught up along the way. There is an intial Application to Enlist in the Australian Imperial Force document in his military service record, addressed to the Recruiting Officer at Dubbo, dated 14th October 1915, which is signed by both his father John Maher, and his mother Georgina Ellen Maher, giving parental permission for him to join, as he was under the age of 21. It is unclear whether he left Dubbo with the Coo-ees, or did not catch up with the Coo-ees until further down the march route, as per family stories he did not join the Coo-ee March until Wallerawang . On his embarkation roll his address at time of enrolment was Springfield, Gilgandra, N.S.W., and his next of kin is listed as his father, J. Maher, Springfield, Gilgandra, N.S.W. Along with many of the Coo-ees, Private Maher departed Sydney on the HMAT Star of England on the 8th March 1916. He arrived in Egypt on the 11th April 1916. On 20th May 1916 he was transferred to the 45th Battalion. On 2nd June 1916 Private Maher left Alexandria aboard the Transport Kinafanus Castle bound for France. He arrived at Marseilles on 8th June 1916. Private Maher served with the 45th Battalion through its first action at Fleurbaix, France in July 1916, then through the battles around Pozieres and Mouquet Farm in August, September and October 1916. On 4th January 1917 Private Maher was appointed Lance Corporal, when the Battalion was preparing to go into action at Dernacourt, France. On 23rd February 1917 the 45th Battalion was in the front line near Guedecourt, France, when Lance Corporal Maher was wounded in action, receiving gunshot wounds to his right buttock and left ankle. He was moved to the 14th Australian Field Ambulance, then moved back to the 45th Casualty Clearing Station on 24th February 1917. On 26th February 1917 he was placed aboard the 31st Ambulance Train, and sent to the 26th General Hospital at Etaples, France. On 1st May 1917 he was placed aboard the Hospital Ship Newhaven at Boulogne, and evacuated to England, He was admitted to the Chatham Military Hospital at Chatham, ,England, later that same day. On 31st August 1917 he was transferred to the 1st Australian Auxiliary Hospital at Harefield, England. On 21st August 1917 he was discharged and sent to the No. 2 Command Depot at Weymouth, England. On 16th December 1917 Lance Corporal Maher began his return to Australia, departing England on board the Hospital Ship Kanowa. He arrived in Australia on 16th February 1917. He was discharged medically unfit on 10th July 1918. Leo, L., email correspondence, 31st July 2014. Australian Imperial Force unit war diaries, 1914-18 War – AWM4 Subclass 23/62 – 45th Infantry Battalion, February 1917.